It’s no secret that while extraordinarily fun, Walt Disney World vacations can also be extremely exhausting. I say this not to scare you off…but it’s fair to assume that no one is choosing a vacation to Disney World to simply “relax” – otherwise you’re probably better off planning a week at the beach! With so much to do and see, you will likely find yourself on the go most of the time. That’s not to say Disney vacations can’t be leisurely – because they can be. One piece of advice I always give people who are visiting Walt Disney World, especially for the first time, is if your schedule allows for it, plan at least one day to do some of the more “laid-back” non-park activities. For me, this includes what is often referred to as resort-hopping as well as a visit to Disney Springs, the area formerly known as Downtown Disney that includes dozens of restaurants, bars, shops (not all of them Disney related either), a movie theatre, a bowling alley and even a simulated hot-air balloon ride called Characters in Flight! If you’re there at night or for other special occasions, you can also catch live music and other performances on the stage. One of the common misconceptions is that other than the four parks, there isn’t much else worth seeing. Not true at all! So, with all that said, I bring you reason number four to visit Disney this time of year: enjoy taking a day to relax by NOT visiting a park. The best thing about both activities I just mentioned – resort-hopping and a trip to Disney Springs – is there is no added cost. That is, there is no park ticket required, which makes for a nice option if, for example, you plan to be in town for four days, you can buy a 3-day park ticket and use the fourth day for something like this. 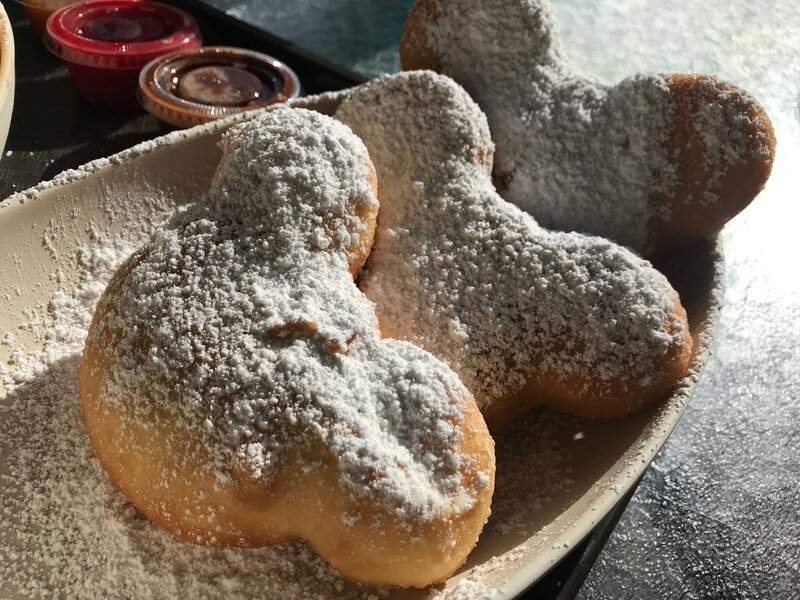 Looking for Mickey-shaped beignets? Look no further than the Port Orleans French Quarter Resort – the only place in all of WDW where you can grab these bad boys (originally only available at Disneyland until this past summer)! How about a Stitch-themed cupcake (of Lilo and Stitch fame)? Then you’ll want to head over to Disney’s All-Star Sports Resort. Are you a fan of all things the Little Mermaid? Then you won’t want to miss the all-new Sebastian’s Bistro located only at Disney’s Caribbean Beach Resort, which just opened some weeks ago. Interested in an all-you-can-eat fried chicken dinner with a country-themed “hoe down” as part of the evening’s entertainment – why then, you need to book the Hoop-De-Doo Musical Revue at Disney’s Fort Wilderness! The point is, as you can see, each resort offers something that you can’t experience elsewhere and can be a big part of your overall WDW experience. And it’s not always about the food (shocking, I know), especially this time of year! As we head into the “festive season,” each resort is decorated beautifully for the holidays, adorned with Christmas Trees and wreaths and even life-sized ginger bread houses (at Disney’s Grand Floridian Resort & Spa, notably). If you ask any Disney fan what their favorite resort is, you’ll get a myriad of answers. That’s the best part – they are all awesome in their own way. The rustic ambience of Wilderness Lodge; the dramatic architecture and Victorian elegance of the aforementioned Grand Floridian; the tropical paradise that is Disney’s Polynesian Village Resort; or the place where Disney movies come to life – Disney’s Art of Animation Resort! You can even feel as though you’re in the middle of an African Safari while staying at the Animal Kingdom Lodge! For my photography friends, there is no better way to spend a leisurely afternoon than to hop from resort to resort, taking in what each has to offer while capturing one-of-a-kind images. And, you may even get your inspiration for your next visit and jot down the “bucket list” resorts you’ll want to stay at in future visits to check off the list. The one thing I’ll note is, you can catch free Disney transportation to any of the Disney resorts from any of the parks (e.g., a bus, monorail, or even ferry boat from Magic Kingdom will take you to any of them) but if you want to go from resort to resort, you’ll likely need your own transportation to do so. OK, let’s talk about Disney Springs. If you’re wondering what happened to Downtown Disney, this area was rebranded in 2015 and has only been getting bigger and better since. It feels like new shops and restaurants are being added every month – I think there is a new restaurant every time I am there. From outlets of celebrity chefs such as Guy Fieri, Morimoto, and Art Smith to personal favorites such as Paddlefish and the Boathouse, there is a restaurant to meet every occasion and every type of cuisine (sit-down or “fast casual”). 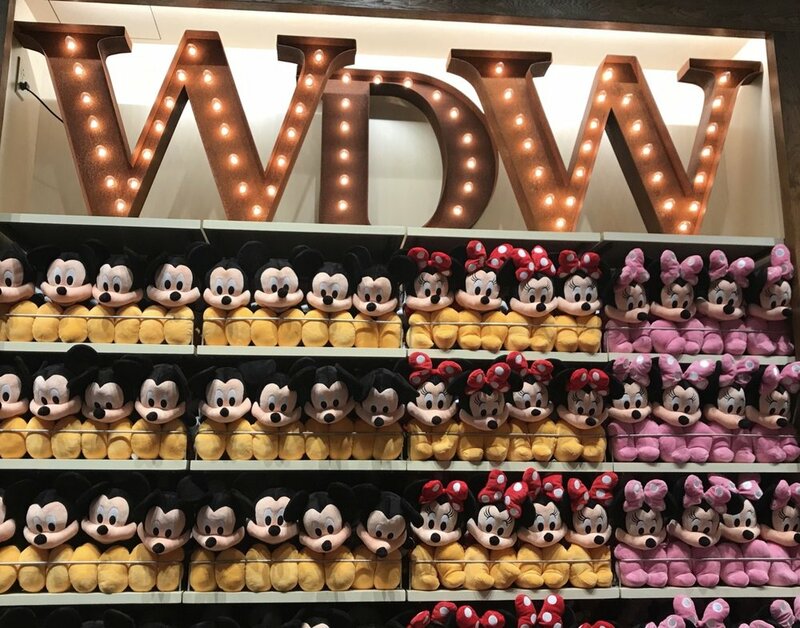 And the shopping, oh the shopping – including the newly renovated World of Disney store, which is basically your average mall Disney Store but on steroids, offering merchandise you can’t find at the stores near your home! Not to mention other iconic brands with outlets there such as Tommy Bahama, Pandora, Under Armor and more, much more. Honestly, Disney Springs is basically becoming a full-day activity in itself. And of course, while I did mention that there is no cost for entry, you still may end up putting a large dent in your wallet with all the shopping treasures available – from Disney trinkets and high-end art to jewelry, home décor, and more. And a lot of the shops will either send your goods back to your hotel (if you’re staying at one of the Disney resorts) and some even ship to your home, so you won’t have to worry about lugging bags around. I also mentioned the Characters in Flight a moment ago. This is something that I’ve seen from afar dozens of times and if you’re driving anywhere within the WDW area, you’ve likely seen the big blue balloon “flying” high in the air over Disney Springs. I decided to finally check it out this past summer – on somewhat of a whim. I took two of my three kids (my older son was off for the day at Universal Studios with my wife, but we won’t talk about that lol) so we were spending the day at Springs and decided to give it a shot. It was great, and the kids loved it. It does feel like you are flying in a hot air balloon even though it does stay somewhat stationary (as in, you go straight up in the air and are hovering overhead while tethered). My knees did get a tad wobbly as we got to the top, but as long as you don’t look down, you’ll be fine! Now, this is not actually operated by Disney but rather a separate company called Aerophile, “the World Leader in Balloon Flight.” Still, a cool experience worth doing once – it offers unbeatable vistas of the entire Disney Springs area and also gives you views of other parks such as Hollywood Studios and Epcot. And as the expression goes, “on a clear day, you can see forever!” Of course, I’ll have to do it twice since my older son did find out we did it and got jealous! Also, as mentioned above, now that we are in the throes of the holiday season (it’s true, like everyone else, Disney seems to skip right over Thanksgiving as soon as Halloween ends) there are a number of festive activities for the family to enjoy, including meeting Santa Claus as well as the famed Disney Springs Christmas Tree Trail. And while the Santa meet and greet does come with a lengthy wait time (sometimes upwards of three hours), you can check-in, grab a pager, then come back when you’re called so you can spend your time enjoying the area vs. waiting in line. Other great options for non-park days include checking out the Disney Boardwalk (located just behind Disney’s Boardwalk Inn) that offers experiences such as a great character meal known as the Bon Voyage Adventure Breakfast with Rapunzel and Flynn Rider (from Tangled) and Ariel and Prince Eric (from the Little Mermaid). In fact, it’s the only character meal in WDW where you can meet Rapunzel, Flynn, and Eric (Ariel is available at others, including Cinderella’s Royal Table at Magic Kingdom). And the ESPN Zone there is the perfect place to just “veg out” and watch football games on Saturdays or Sundays during the fall! Another great option for a non-park day is one of two Disney waterparks – either Blizzard Beach or (my personal favorite) Typhoon Lagoon, though both will cost you about the same as a standard one-day park ticket. I know for many of you, your time at Disney is limited and I totally get it if you choose to spend all your time at one of the parks – you can’t go wrong there. But just something to consider when planning that trip because as you can see, there are plenty of ways to spend relaxing, leisurely days while at Disney and many of them won’t cost you a dime! Let me know – do you ever plan time to do resort hopping? How about your favorite spot at Disney Springs?! I’d love to hear from you and know what your secrets are to enjoy some downtime while in between the hustle and bustle of the parks!